Shinobu Wakamiya: the ninja queen emerges. Episode 8 of Chihayafuru season 2 was a fine tale of people sharing their love for Karuta. It even had a great moment for Tsutomu, who did something truly selfless for the good of the team. He has turned out to be an excellent supporting character. But the greatest thing about the episode, for me, was in the closing moments of the episode; Arata walks up the stairs to the temple grounds and Shinobu appears. All of the important players have assembled at Omi Jingu and the part I have been waiting for, since LAST February, is about to begin. Shinobu was such a cool character, full of contradictions, and excellent rival material. 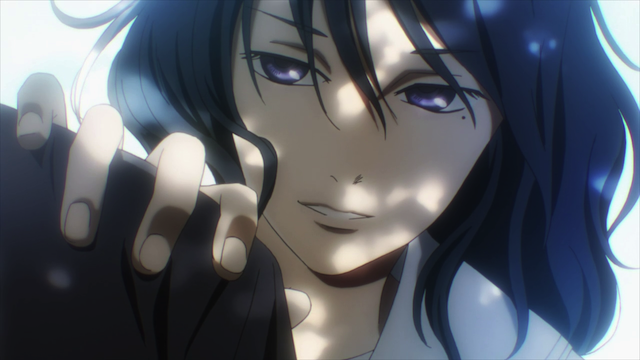 I really want to see her face off against Chihaya again. Arata has barely been shown in action since his grade school days, but he has been the specter haunting this series all along. There is going to be some great Karuta in the upcoming weeks. I can’t wait to see what happens next! Yeah, I have enjoyed the ride so far, but now we get the payoff for everything that has been built up since the very first episode. Yahoo! What I find most interesting about Shinobu is that she represents loneliness: she doesn’t belong to a Karuta Society or school Karuta club, and she has no mentor. Chihaya is the opposite. Both young women excel at Karuta, but the main difference is that Shinobu turned to Karuta out of loneliness, while Chihaya immersed herself in the game to pursue common ground with friends. That is a great point. Chihaya talks about making friends with the cards, but she has fairly healthy relations with real people. Shinobu seems to ONLY have a relationship with the cards.